Saturday’s bluebird skies, warm temperatures and deeper than normal snow made for a perfect day with absolutely spectacular vistas. The ascent up Mt Ruth was typical softening snow, but except for near the rocks, we were never sinking in too much. From the summit of Ruth, we traversed more/less horizontally around to the right and below the bumps that mark the continuation of the Mt Ruth ridge. After a few hundred yards we were back near the south ridge that leads to the Steamboat summit. We ascended the snow just below the actual ridge, skirting the top edges of the Inner Glacier. I knew from late season pictures, (like the one on the Route/Place record I took from near 3rd Burrows in late August), that the crevasses form lower down on the glacier, particularly where the terrain steepens and the ice thickens. We were perfectly safe as long as we kept high on the slopes. Down on the Inner Glacier, there were lots of skiers and a few climbers. We never saw anybody roped up down there. The summit of Steamboat, in spite of the year’s big snow fall, was bare. The sun warmed rocks made the temperature actually hot. I was surprised at how big the summit was and how much space there was to wander around, including a point about 200’ and 45 degrees right above the climber’s tents at Camp Sherman where we enjoyed front row balcony seats to the greatest vista in the Northwest. 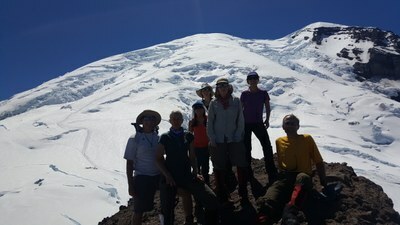 We descended via Mt Ruth and enjoyed thousands of feet of the Cascade’s very best glissade. A moderate pace and 90 minutes on the summit made for a little less than an 11 hour day.